Gene Burnett passed away Wednesday, June 15, 2011. He was born in Wellsville, KS on Dec. 4, 1919, to Frank and Allene Burnett. His family eventually settled in Lawrence, where he graduated from high school in 1937. While in high school he began a life-long interest in flying. He would ride his bike to the airport, where he did odd jobs and had the opportunity to learn welding. In 1939, he married Barbara Ann Knott, and they moved to Kansas City, where he worked at a defense plant during the war. It was there he earned free flying lessons by getting the highest score on an entrance test. He obtained his pilot’s license, and by the end of the war he had bought his first airplane – a Stearman biplane that had been used as a military trainer. He attained instructor and commercial licenses as well. He owned several private planes through the years and even built a “Starduster Too” biplane in his own workshop. By the time of his last flight at age 84 he had accumulated over 6,500 hours. After the war he and his family (children Janet and David) moved back to Lawrence. He opened Midwest Manufacturing and later Burnett Instrument Company. He manufactured surgical instruments, most of which he designed himself, and held many patents. He designed and manufactured the first electric skin grafter. He also designed many plastic disposable examining instruments. Other products included a cast saw, a hand therapy device, and dental devices. The business was sold in 1970. Gene served on the Board of Directors of the 1st National Bank (now USBank) from 1970 to 1990; the Board of Directors of Lawrence Savings,; was Vice President of the Lawrence Chamber of Commerce in 1970; was a member of Sertoma, receiving their Service to Mankind Award in 1973; and a member of Kiwanis, receiving their Substantial Citizen Award for years of service to the community in 1979. He was a member of the Lawrence Memorial Hospital Board for 10 years, during the first major expansion. He and Barbara were contributors to the Bob Billings Cardiac Unit. Gene was active with the Lawrence United Fund for 24 years, and with Habitat for Humanity – donating materials and labor, receiving their Volunteer of the Year award in 1999. He was awarded the Baker University Lawrence Business Person of the Year award in 1991. Although Gene and Barabara never attended Kansas University they made many contributions. After selling the company, they decided to give back something to their field of business. They donated a major portion of the funds needed to build the Gene and Barbara Burnett Burn Center, which was opened in 1973 at the Kansas University Medical Center, and also funds to establish a hand surgery unit there. Gene served on the KU Medical Advisors Committee from 1974-1984 and received a certificate of appreciation from them in 1977. The KU Medical School presented him with a certificate of appreciation for service to KU as a member of the Chancellor’s Association in 1979. He served 5 years on the Advisory Board of the KU Surgeons Association. After he flew track coach Bob Timmons around Lawrence to plot the KU Relays marathon, he became the marathon manager. He helped design a more efficient wind gauge to determine the velocity for track events. In 1972, Gene and Barbara donated funds for the Burnett Center for Religion and Performing Arts, including an adjoining auditorium, at Bethany College in Lindsborg, Kansas. They also provided funds to renovate the music department of the college. It was named in memory of Barbara’s brother, Thomas DeWitt, who attended Bethany. In 2000, Gene established a scholarship at Lawrence High in honor of his wife. The Barbara Burnett Scholarship, endowed in 2008-09, is presented each year to a student who is interested in pursuing a career in a health or medical-related field. Gene was a member of Trinity Lutheran Church since 1938 and chaired nine different committees. He was Boy Scout Master of Troop 58 at the church from 1955-1963. The highlight of his Scouting experience was a trip to Philmont Scout Ranch in New Mexico. Barbara became a member of the church at the age of 9 and was an active member of the women’s organizations. Barbara died in November of 2007. Gene’s younger brother, Jim Burnett, preceded him in death. His older brother, Donald, lives in Colorado. Also surviving are three grandchildren, Shannon and Kristi, and Andrew, and six great-grandchildren. The family wishes to thank Gene’s home caregivers, Lisa Arch and Irene Garcia, and the staff at Douglas County Visiting Nurses and Hospice and Brandon Woods South for the wonderful care they gave him. 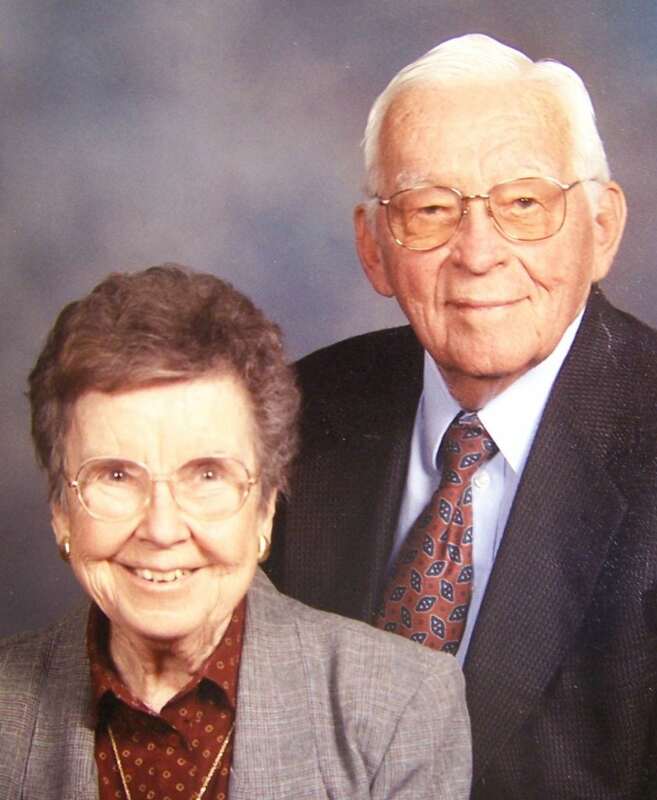 Gene and Barbara will be remembered at the 10 o’clock worship service at Trinity Lutheran Church on July 17, followed by the annual Corn Fest, which will be dedicated to them. Donations in their memory may be made to Lawrence Habitat for Humanity, 720 Connecticut, or the Lawrence Schools Foundation, for the Barbara Burnett Scholarship, 110 McDonald Drive and may be sent in care of Warren-McElwain Mortuary.